TEMECULA, Calif., August 28, 2018 – Partners In Leadership LLC, the firm that guides clients in defining Key Results™, shaping Cultural Beliefs® and solving Accountability Gaps, announces that it will be exhibiting at the OPEX Summer 2018 Leaders Summit at the Hilton San Diego Resort and Spa in San Diego, California, Aug. 27-29. This marks the first year the organization has taken its accountability and leadership training and its culture process consulting to the event. Partners In Leadership will be located at booth number 11. 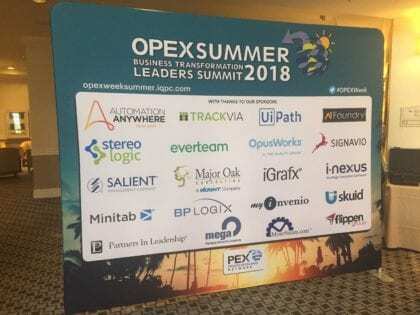 OPEX Summer gathers more than 100 operational leaders across industries, leading brands, market disrupters, and industry gurus to learn how to build and execute a world-class operational excellence and business transformation strategy. “We’re excited to share at this event for the first time our innovations around transformation strategy including leadership development, workplace accountability, and organizational culture,” said Barton. Attendees have the unique opportunity to learn about Partners In Leadership’s new index developed to measure an organization’s accountability, engagement and culture levels and how this relates to a company’s ability to handle change and the speed necessary in today’s marketplace. The new index from Partners In Leadership is based off its 2014 Workplace Accountability Study that involved over 40,000 participants across hundreds of organizations from 2011-2014. The index identifies things such as if employees are seeking feedback, owning their work, cross-collaborating and creatively problem-solving for achieving what matters most — key results. “When organizational leaders say they need or want more engagement in their employees, what they really mean is they want a more accountable workforce to achieve the results needed now and for long-term sustainability,” said Martin. “Attendees to our booth gain the opportunity to discover proven organizational transformation tools and cutting-edge operational methodologies that helps leaders deliver on results,” said Barton. For more information regarding Partners In Leadership’s exhibition at OPEX Summer 2018, please contact Cassandra Wagner at cassandra.wagner@partnersinleadership.com.